Anyone wanting to become a competent golfer needs to follow these golf swing tips for beginners to develop a complete range of shots. As in any game, there will be situations where a different shot is required. These golf swing tips for beginners will help you build a confident arsenal of strokes so no hurdle will stand in your way. The long-range drive is one of the most difficult for a beginner to master as it requires a technique to deliver power to project the golf ball. Understanding the movements of the body is fundamental to building a consistent golf swing to achieve distance and accuracy. Practice getting the sequence right on the driving range rather than just trying to hit the ball as hard as you can. To master a repeatable golf swing click here. The Warm-up: Start by warming up, you need to get the blood flowing along your arms and around your body so that your muscles relax. Stretching exercises are important so that your body can adjust naturally to the new sequence of movements. A constructive warm-up will energize your body and give you the right frame of mind to focus on making the golf swing repetitive. Relax your arms: For the ball to be driven long distances, your arms need to be relaxed and rotate around your body naturally. The arms need to be stretched out, with the power coming from the shoulder turn, so it is important not to tighten the muscles. The distance is achieved with the follow through as the ball is swept away by the club face. The centrifugal force: Imagine your spine as the central pivot. Keeping your arms straight but relaxed turn your shoulders back around the spine keeping your head still. This centrifugal force will deliver all the power required. Getting this basic right can then be practiced to achieve longer distance with greater accuracy. For step by step guidance click here. Shift your body weight: As you get used to the movement of your shoulders turning and your arms swinging naturally, your confidence will grow to allow you to move your body weight behind the shot. The follow through: This is the most underrated part of the golf swing because it is at this point of impact you need to allow the golf club to do the work. Keep your hips square and let the arms complete the swing. 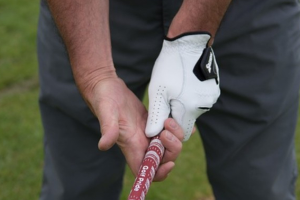 Grip positioning: Gripping the golf club too hard will impair the natural swing. When taking your stance over the ball it is important to remember that to achieve a consistent result the clubface needs to return to the exact spot at impact. By taking a firm but flexible grip will allow the wrists the movement they require to increase the follow through. Conclusion: The bottom line is practice makes perfect! But the important thing is to remember practicing getting it right! So many golfers on the driving range are just trying to hit the ball as hard as possible with their driver. Sometimes better results can be achieved by starting with a lofted club and building up to the woods. Getting the feel of your body through the swing with each club will gradually build into your psyche so it becomes second nature on the course. Putting is an important part of the game, so for more tips on putting like a pro click here.